Why do you love transportation? Transportation focuses on providing safe and efficient infrastructure that improves and connects our society. I love how the work we do as transportation engineers directly benefits the public and helps people live their daily lives better. ​What do you look forward to doing with ITE this year? I am excited to get to know all of our members and create a tight-knit group of transportation enthusiasts on our campus! I hope to help make ITE a family for our members by hosting more social and bonding events. I also look forward to regaining the Traffic Bowl crown at Western District in Monterey next summer. Why do you love transportation? I love how transportation affects everyone. A good transportation system encourages communication and a sense of community! ​What do you look forward to doing with ITE this year? I look forward to planning our conferences, getting to know our new members, and networking. Why do you love transportation? The social aspect. How transportation affects the prosperity and dynamics of people around the world. ​What do you look forward to doing with ITE this year? Weird email announcement sign-offs. Please read them! Meeting and getting to know people! Why do you love transportation? I love how fundamental transportation is for the operation of cities today. I'm driven by its ability to be people-orientated. The perplexing solutions of transportation always keep me intrigued. I'd like to travel the world someday, and that wouldn't be possible without transportation. ​What do you look forward to doing with ITE this year? 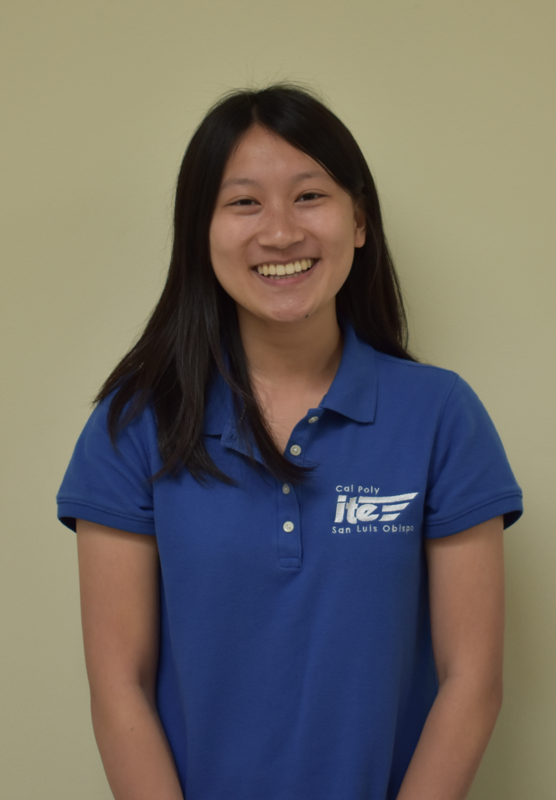 I look forward to inviting new freshmen to upcoming ITE meetings and events, sharing my passion for transportation, and learning more about transportation. Why do you love transportation? Transportation is everywhere and seeing how Interactions between bicyclists, drivers, and pedestrians can change the flow of traffic makes me love it! I also love transportation and the diversity of transportation modes! ​What do you look forward to doing with ITE this year? Planning awesome events that everyone can get excited about and can get away from stress and school for a day or a couple hours! ​What do you look forward to doing with ITE this year? Learning more about the transportation industry and making a lot of lasting relationships. ​What do you look forward to doing with ITE this year? I'm excited to learn more about transportation engineering and city regional planning through meetings. Also, I'm excited to work with a wonderful team! Why do you love transportation? I really enjoy the people aspect of transportation - collaborating with everyone, including users, can allow for a more fitting design/solution while encouraging open communication. Also, transportation designs are used every second of every day. There's always the ongoing task to develop improvements in performance and efficiency, which also means a large variety of projects to work on. ​What do you look forward to doing with ITE this year? Student Leadership Summit in Berkeley and Western District Conference in Monterey! ​What do you look forward to doing with ITE this year? Encouraging underclassmen to explore transportation and traveling to new places!